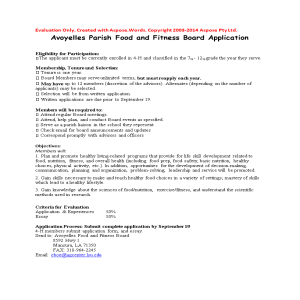 Below you will find information about submitting Avoyelles Parish SET Board and Food and Fitness Board applications. The applicant must be currently enrolled in 4-H and in the 7th-12th grade the year they serve. Board members may serve unlimited terms, but must reapply each year. May have up to 12 members (discretion of the advisors). Alternates (depending on the number of applicants) may be selected. Selection will be from written application. Written applications are due prior to September 19. Attend, help plan, and conduct board events as specified. Serve as a parish liaison in the school they represent. Check email for board announcements and updates. Correspond promptly with advisors and offices. To assist with the development of educational programs that provide opportunities for advocacy, leadership, and youth voice through science related workshops and programs within the 4-H arena and at school where SET board members are enrolled. To gain knowledge about the sciences and understand the scientific methods used in research. Application Process: Submit completed application by September 19, 2014. 4-H members submit application form and essay.